To Cite: Abedini A, Razavi F, Mehravaran H, Farzanegan B, Nikzad Jamnani A, et al. Successful Removal of a Pulmonary Foreign Body Using C-Arm-Guided Flexible Bronchoscopy from Distal Airways of a Seven-Year-Old Boy: A Case Report, J Minim Invasive Surg Sci. 2018 ; 7(2):e81925. doi: 10.5812/minsurgery.81925. Introduction: Foreign body aspiration into the respiratory tract is a life-threatening condition and an important cause of morbidity and mortality due to the suffocation in the pediatric age. Case Presentation: We present a foreign body aspiration which is related to a seven-year-old Iranian boy. His complaints included an intermittent cough and dyspnea. The distal impacted endobronchial foreign body has been retrieved by using rat tooth forceps under C-arm-guided flexible bronchoscopy after the failure of two previous interventions. Conclusions: In order to reduce the unsuccessful efforts and also mortality and morbidity rate which are the result of foreign body aspiration, early recognition and also appropriate intervention are crucial. For this purpose, the use of the fluoroscope C-arm device before bronchoscopy may increase the chance of successful extraction of an endobronchial foreign body. Copyright © 2018, Journal of Minimally Invasive Surgical Sciences. This is an open-access article distributed under the terms of the Creative Commons Attribution-NonCommercial 4.0 International License (http://creativecommons.org/licenses/by-nc/4.0/) which permits copy and redistribute the material just in noncommercial usages, provided the original work is properly cited. Foreign body aspiration (FBA) is considered as a medical emergency and an important cause of asphyxiation related mortality especially in pediatric population, and sometimes in adults, due to the delay in diagnosis and therapeutic procedures (1). Related complications vary from atelectasis pneumonia and abscess formation to secondary dislocation with a serious airway obstruction (2, 3). In contrast to organic materials including peanuts (4), toys, coins and teeth in industrialized countries (2) the most common aspirated material is bone pieces in Asian countries (2). The diagnosis of FBA is based on high clinical suspicion, taking history, and also performing an accurate physical examination. 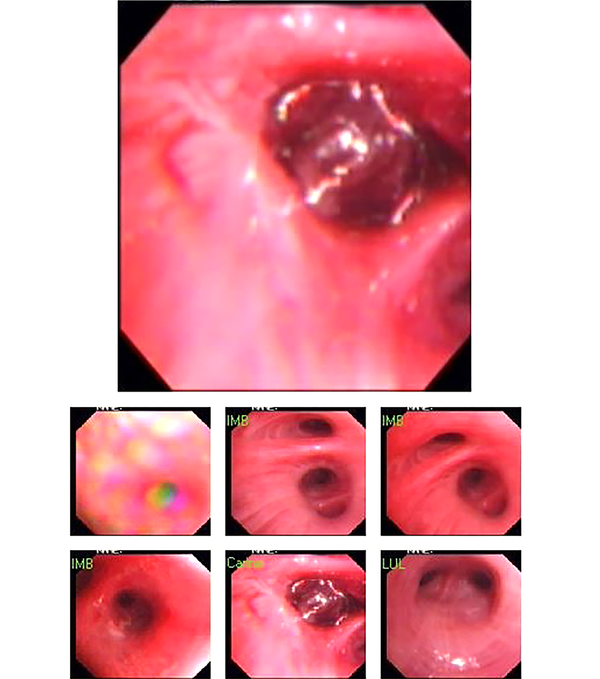 Bronchoscopy is the best diagnostic and therapeutic method for FBA (5). Typically, the fiber optic is used to diagnose object and the rigid one is used to remove it (6). In each condition, using less invasive method for patients' relief and avoiding wasting time is our eventually aim. A seven-year-old Iranian boy was referred to interventional bronchoscopy unit of Masih Daneshvari Hospital, due to a previous history of FBA. His complaints included an intermittent cough and dyspnea for the first 10 days while he was playing with his toys. A referral to the pediatric hospital was made thereafter. The chest radiograph revealed a screw in the right main bronchus (Figure 1). Two previous interventions for extraction of the foreign body (FB) were unsuccessful, and the FB had been pushed to a deeper level of the right lower lobe bronchus, outside the view of flexible bronchoscope during those procedures. In December 2017, 10 days after the first symptoms appeared, he was referred to the Interventional bronchoscopy unit at the Masih Daneshvari Hospital. Initial vital signs were as follow: Blood pressure (BP) 105/65 (mmHg), pulse 102 (bpm), respirations 16 (breaths per minute) and ambient SpO2 97%. In addition, chest auscultation revealed crackles in the lower aspect of the right posterior hemithorax. Re-imaging using X-ray showed the screw in the inferior aspect of the right paracardiac region (Figure 1). Under standard monitoring, general anesthesia was induced by the injection of propofol, and atracurium with controlled ventilation. Flexible bronchoscope Olympus BF-200 Outer diameter, 5.7-mm instrument channel 2.0-mm (Olympus LFP, Olympus America Inc., Melville, NY, USA) was passed through the trachea (Figure 2). Initially, the left side was examined. The examination of the right side and the right lower lobe bronchus did not reveal the foreign material. Therefore, we decided to retrieve distally impacted endobronchial FB using rat tooth forceps, under C-arm-guided flexible bronchoscopy. The FB was released and extracted successfully, using C-arm-guided flexible bronchoscopy (Figure 3). The total procedure lasted for 30 minutes and the anesthesia was reversed at the end of the procedure. During the recovery, his vital signs were BP of 111/70 (mmHg), heart rate (HR) 110 (bpm) and SpO2 98%. The study was approved by the Ethics Committee of Masih Daneshvari Hospital, Shahid Beheshti University of Medical Sciences, and informed consent was obtained from the father of the patient. The patient was discharged from the hospital on the same day. Doses of steroid and an antibiotic were given in order to avoid airway edema and infections, respectively. One follow-up was conducted three months after the patient's discharge. There were not any signs and symptoms of respiratory morbidity in the patient. FBA is rare and more tolerable in adults, but this life-threating condition is known as one of the main causes of morbidity and mortality due to the suffocation in children, especially in those under five years old (7, 8). As children usually tend to put objects into their mouth, they are more susceptible to FBA (5), and an obvious male predominance has been observed in previous studies (9). The signs and symptoms are varied amongst patients with FBA history depending on the material and the location of the swallowed objects, depth, and level of aspiration, which may lead to a false diagnosis, such as obstructive diseases (10). Therefore, it seems that history taking is more important than their symptoms (11). The time from aspiration to ejection varies from minutes to days or even months. The aspirated materials can be organic and inorganic objects (8). Posteroanterior and lateral chest radiographs are known for detecting and locating metal objects (12). X-ray is the main method for investigation of FB, but due to producing some false-negative results do not have a better sensitivity and specificity than history taking (7). Rigid bronchoscopy is the most common procedure used to retrieve FBA in children (13). Flexible fiberoptic bronchoscopy (FOB) is another method for diagnosis and retrieval of the FB (14). In cases of rigid bronchoscopy failure, a posterolateral thoracotomy is performed and in cases of endoscopic treatment failure, surgery remains the only remedy (15). It is important to mention here that the first attempt to remove the FB is vital since elongated procedures and repeated efforts can lead to dislodgement, airway trauma, and edema. Bronchoscopy under C-arm guidance has been performed previously. Research by Wankhede et al. (16) showed that in complicated cases, extraction was accomplished using the C-arm-guided insertion of Fogarty catheter, through a plastic bead from the right main bronchus. A study by Hosseinpour et al. (17) reported a case of a nine-year-old boy, presenting with a needle aspiration. Extraction was accomplished through a C-arm X-ray device, intraoperatively after marking the left lower lobe via a hemostat. In conclusion, use of the fluoroscope C-arm device before bronchoscopy may decrease the risk of mortality and morbidity of the patients with FBA. We would like to thank the interventional pulmonology team of Masih Daneshvari Hospital who helped us to get results of better quality. 1. Jabbardarjani H, Kiani A, Arab A, Masjedi M. Foreign body removal using bronchoscopy and argon plasma coagulation. Arch Iran Med. 2010;13(2):150-2. [PubMed: 20187671]. 2. Chen CH, Lai CL, Tsai TT, Lee YC, Perng RP. Foreign body aspiration into the lower airway in Chinese adults. Chest. 1997;112(1):129-33. [PubMed: 9228368]. 3. Jabbardarjani HR, Kiani A, Arab A. Removal of impacted foreign body by bronchoscopic modalities. Tanaffos. 2009;8(4):60-4. 4. Baharloo F, Veyckemans F, Francis C, Biettlot MP, Rodenstein DO. Tracheobronchial foreign bodies: Presentation and management in children and adults. Chest. 1999;115(5):1357-62. [PubMed: 10334153]. 5. Kwok MM, Wong A, Paddle P, Goergen S, Rimmer J. Clinico-radiological predictors of positive rigid bronchoscopy findings in children with suspected tracheobronchial foreign body aspiration. Aust J Otolaryngol. 2018;1:11. doi: 10.21037/ajo.2018.01.07. 6. Casson AG, Guy JR. Foreign-body aspiration in adults. Can J Surg. 1987;30(3):193-4. [PubMed: 3580978]. 7. Metrangolo S, Monetti C, Meneghini L, Zadra N, Giusti F. Eight years' experience with foreign-body aspiration in children: What is really important for a timely diagnosis? J Pediatric Surg. 1999;34(8):1229-31. doi: 10.1016/s0022-3468(99)90157-4. 8. Passali D, Lauriello M, Bellussi L, Passali GC, Passali FM, Gregori D. Foreign body inhalation in children: An update. Acta Otorhinolaryngol Ital. 2010;30(1):27-32. [PubMed: 20559470]. [PubMed Central: PMC2881610]. 9. Lima JA, Fischer GB. Foreign body aspiration in children. Paediatr Respir Rev. 2002;3(4):303-7. [PubMed: 12457600]. 10. Sharma SB, Amata AO. Foreign body aspiration in children: A report of five cases. West Indian Med J. 2010;59(6):717-21. [PubMed: 21702249]. 11. Zang CS, Sun J, Huang HT, Sun Y, Qiu J, Jiang Y, et al. Inhaled foreign bodies in pediatric patients: A review and analysis of 3028 cases. Int J Clin Exp Pathol. 2017;10(1):97-104. 12. Mahmud T, Shafiq A, Hafeez A, Saqib M, Farooq S. Sewing machine needle retrieval from distal airways using flexible bronchoscope under fluoroscopy. Respir Med Case Rep. 2016;19:132-4. doi: 10.1016/j.rmcr.2016.06.010. [PubMed: 27722083]. [PubMed Central: PMC5050291]. 13. Baram A, Kakamad FH, Bakir DA. Scarf pin-related hijab syndrome: A new name for an unusual type of foreign body aspiration. J Int Med Res. 2017;45(6):2078-84. doi: 10.1177/0300060517711086. [PubMed: 28627978]. [PubMed Central: PMC5805209]. 14. Al-Ali MA, Khassawneh B, Alzoubi F. Utility of fiberoptic bronchoscopy for retrieval of aspirated headscarf pins. Respiration. 2007;74(3):309-13. doi: 10.1159/000098477. [PubMed: 17215569]. 15. Fenane H, Bouchikh M, Bouti K, El Maidi M, Ouchen F, Mbola TO, et al. Scarf pin inhalation: Clinical characteristics and surgical treatment. J Cardiothorac Surg. 2015;10:61. doi: 10.1186/s13019-015-0268-z. [PubMed: 25928343]. [PubMed Central: PMC4418052]. 16. 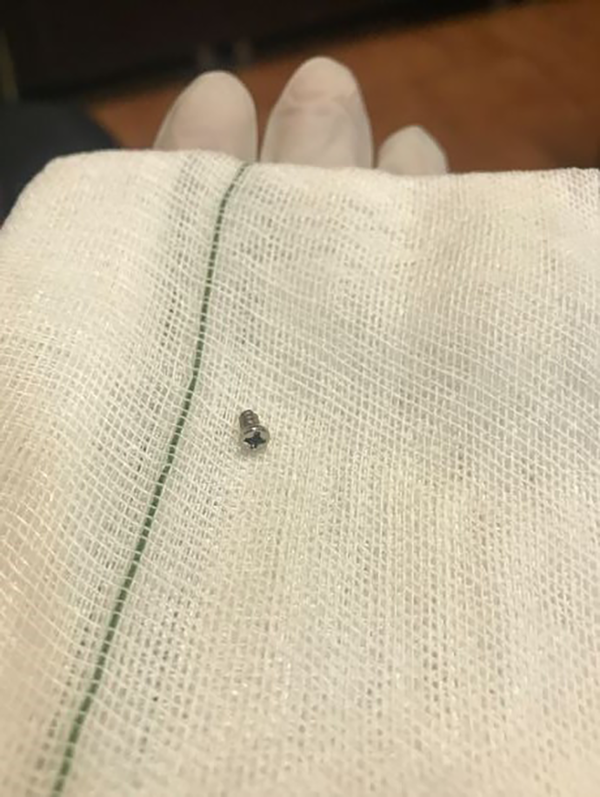 Wankhede RG, Maitra G, Pal S, Ghoshal A, Mitra S. Successful removal of foreign body bronchus using c-arm-guided insertion of fogarty catheter through plastic bead. Indian J Crit Care Med. 2017;21(2):96-8. doi: 10.4103/ijccm.IJCCM_148_16. [PubMed: 28250606]. [PubMed Central: PMC5330062]. 17. Hosseinpour M, Kolahdouzan M. Needle in the lung: A difficult case of pulmonary foreign body. Trauma Mon. 2017;In Press(In Press). doi: 10.5812/traumamon.13575.